Explanatory sign does not change color. Signs should be placed two seconds from the beginning of the IceAlert® series, rounded to the nearest 50 feet but never less than 50 feet. Sign dimensions are 18″ x 24″. What makes IceAlert® unique is that it provides a visual alert by changing colors from white to blue only when the potential for ice actually exists. IceAlert® allows people to “see” the temperature. IceAlert® products have been on the market 20 years and were originally developed as a roadway safety program for Motorists. 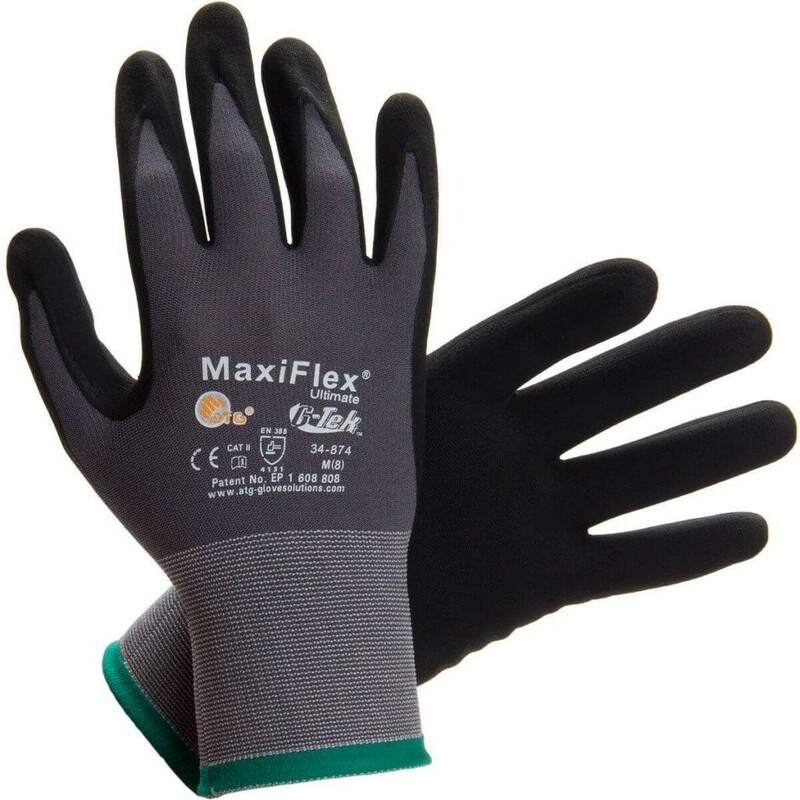 Approximately 15 years ago we started working with Occupational Health and Safety professionals. The Bluestar Roadway SystemTM is simple and effective, and motorists grasp the concept quickly. IceAlert temperature-sensitive reflectors (BSR1000) mount on standard guideposts and act as normal delineators until temperatures near freezing. 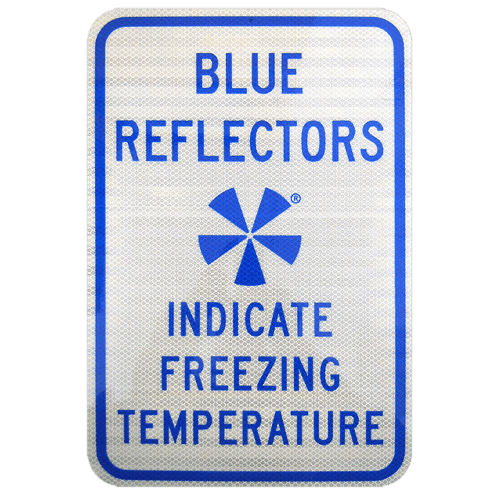 At that time the reflectors turn blue, alert drivers of freezing conditions, and eliminate the unpleasant surprise of difficult-to-see ice. IceAlert® roadway reflectors (BSR1000) are most effective when installed in a series of 3-5 reflectors, postioned well in advance of the problem area, to give motorists time to react to the ice-warning. Spacing between individual IceAlert® reflectors is generally identical to standard guidepost reflector spacing, and primarily dependent upon traffic speed. To insure maximum effectiveness and consistency in application, we offer site design help. The Bluestar SystemTM for roadways is specifically designed for your particular site. You send a simple site description of the bridge, overpass, roadway, off-ramp, etc to us, and we provide a site-specific plan which considers traffic speed and topography, and which includes sign and reflector spacing, plus detailed installation instructions. You receive a complete plan for your site plus the appropriate signs, reflectors and hardware. 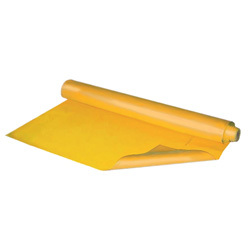 IceAlert® temperature-sensitive reflectors (BSR1000) are rugged and very easy to install. IceAlert® are post-mounted, stand-alone units with no batteries or electronic components. Installation does not require pavement cuts, just drive a post and bolt the IceAlert® to it, or bolt an IceAlert® to an existing post. Please look over our web site as you think of areas in your jurisdiction that might provide ice-related “surprises” to your local motorists this winter. If you have any questions, please contact us and we’ll be happy to provide a proposal that will surprise you with its economy. IMPORTANT! The Bluestar® System reflectors (BSR1000) are instruments that must be handled with care, until they are properly mounted to an approved post. At that time they can handle any thing Mother Nature or snowplows can throw at them. Bluestar® reflectors (BSR1000) must not be mounted over or near other reflective surfaces. 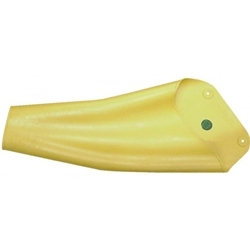 Secure the reflector and the backing plate to the post with the tamper-resistant hardware supplied. Take care not to deform the reflector during installation. It must be supported on a flat surface. If you are installing on steel channel posts with the channel facing traffic then you must first attach the backing plate to the installed posts, secure with pop rivets (not supplied). Then slip the reflector into the backing plate and secure with supplied hardware using the enclosed drawing as a guide. Signs should be placed two seconds from the beginning of the IceAlert® series rounded, to hte nearest 50 feet but never less than 50 feet.